Important indicators about Americans’ health and well-being are trending the wrong way: For the first time in almost a quarter century, the nation’s life expectancy has declined. Meantime, fatal overdoses by Americans taking opioid drugs continued to surge and exceeded 30,000 in 2015. And abuse of heroin has exceeded that of traditional prescription painkillers, with deaths due to heroin-related causes surpassing gun homicides. 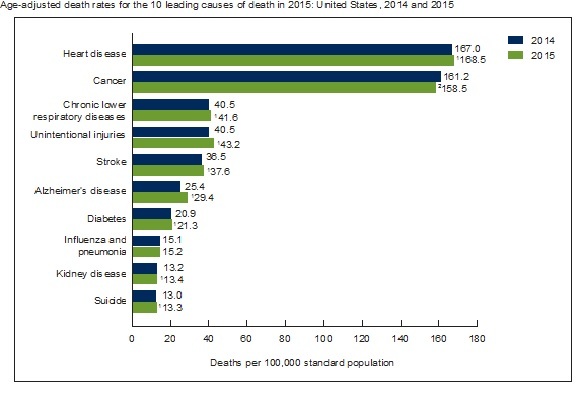 Experts were surprised by the life expectancy decline, which reflected an increase in eight of the top 10 causes of death (see figure right from the federal Centers for Disease Control and Prevention, National Center for Health Statistics) including heart disease, diabetes and kidney disease, and Alzheimer’s—but not cancer. It may be a statistical blip from one particularly bad year. The last time a comparable dip occurred was in 1993 due to high rates of deaths from HIV-AIDS, flu, homicides, and accidental deaths. Some experts said the decline in life expectancy, which for men fell on average in years from 78.9 to 78.8, may be attributable to increasing issues with Americans and obesity, and health care hitting limits on progress against heart disease. Because death rates rose for white men and women, as did deaths due to unintended causes and suicide, some experts saw evidence of the further ravages of the opioid drug abuse epidemic and what many have described as the widespread disease of despair. I’ve written how poor, less educated, ex-urban whites, both the young and middle-aged, are dying at unexpected and higher rates. A Nobel Laureate and his wife have explored this phenomenon, theorizing that it is partly attributable to economic stagnation and decline in certain regions of the nation, as well as whites’ diminished sense of opportunity and social preeminence. Clearly, the drug abuse figures are grim. I’ve written how law enforcement and public health officials are struggling with the dismal advance that abusers appear to be making from powerful prescription painkillers, unleashed with the marketing and mendacity of Big Pharma and doctors, to synthetic opioids and narcotics like heroin. Indeed, the Washington Post has reported that a third of those who use powerful prescription painkillers for at least two months become addicted to or physically dependent on the drugs. It’s tragic that 33,000 Americans died of opioid drug overdoses in 2015, and it’s obscene that the 12,989 heroin-related deaths exceeded the nation 12,979 gun homicides. I see in my practice the bad consequences of dangerous drugs, and it continues to anger me that Big Pharma and physicians aren’t doing even more to halt the opioid drug crisis. Instead, as prosecutors are asserting in yet another case, both seem complicit in increasing it with stupefying practices: It’s hard to imagine but prosecutors say that MDs in multiple locations, for drug salesmen’s attention, favors, and, yes, cash, put their professions and practices at risk to go on prescription-writing sprees with a drug like fentanyl, a painkiller said to be 50 times more powerful than morphine. These kinds of reprehensible practices need to be put to a halt, and if criminal prosecutions help, that’s all to the good. The 21st Century Cures Act, just approved by Congress and expected to be signed by President Obama, includes in its $6.3 billion boost for health care funding a sizable sum—$1 billion—to fight opioid drug abuse. Here’s hoping Big Pharma and even more physicians will join what should be a pitched battle against this scourge.